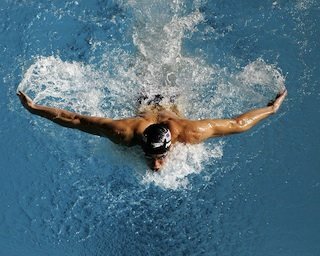 Exercise for depression including swimming can be an effective treatment for depression. Sometimes, as good or better than antidepressants, especially for individuals with treatment-resistant depression. I’ve always known that I climb out of any pool a lot happier than when I dove in. Yes, you know that the effects of exercise improves general health markers like high blood pressure, arthritis and type 2 diabetes. But, why is exercise an effective natural treatment for major depressive and anxiety symptoms? For starters, the benefits of exercise stimulates brain chemicals that foster the growth of nerve cells. Additional nerve cells helps to promote mental health and prevent mental illness. Exercise also affects neurotransmitters such as serotonin that influence mood and produces ANP, a stress-reducing hormone, which helps control the brain’s response to stress and anxiety. But swimming, for me, seems to zap a bad mood more efficiently than even running. Swimming a good 3000 meters for me can, in the midst of a depressive cycle, hush the dead thoughts for up to two hours. It’s like taking a Tylenol for a headache! It was with interest, then, that I read an article in “Swimmer” magazine about why, in fact, that’s the case. The moral of the story is to get 30 minutes of physical activity to reduce stress and anxiety disorders. Swimming and other exercises are a long term balm for the scourge of depression in the United States and the World. Here’s the gist, excerpted from the article “Staying Happy?” by Jim Thornton in the Jan/Feb issue of “Swimmer” magazine. Regardless of cause, a growing number of researchers and psychologists alike have become true believers in the great benefits of swimming. “We know that swimming decreases both anxiety and depression” says sports psychologist Aimee C. Kimball. Swimming serves, as well, to sop us excess fight-or-flight stress hormones, converting free-floating angst into muscle relaxation. It can even promote so-called “hippocampal neurogenesis” – the growth of new brain cells in a part of the brain that atrophies under chronic stress. By concentrating on different aspects of their stroke mechanics, from hip rotation and kick patterns, to streamlining and pulls, regular swimmers practice this intuitively. The result: On a regular basis, most get a break from life’s not always pleasant stream of rumination. Moreover, since most pools have set times for lap swimming and coached Masters workouts alike, regular swimmer usually find themselves settling into a schedule that becomes automatic. There’s no need to decide if you should go exercise now or later. For stressed out people, this lack of options, says Coquillard, is paradoxically comforting because it removes the burden of yet another decision. “All you have to do is show up at the regular time,” he says. You know you’ll leave the pool better than when you arrived. Therese J. Borchard is Associate Editor at Psych Central . Follow her on Twitter @thereseborchard to learn more about exercise for depression and swimming as a prime choice natural depression treatment. Another excellent read which includes exercise for depression is ‘From Depression to Life: Crossing the Bridge' by Ben Isaac. Have you used exercise for depression? If yes, please share your story how exercise has helped you. Thanks!